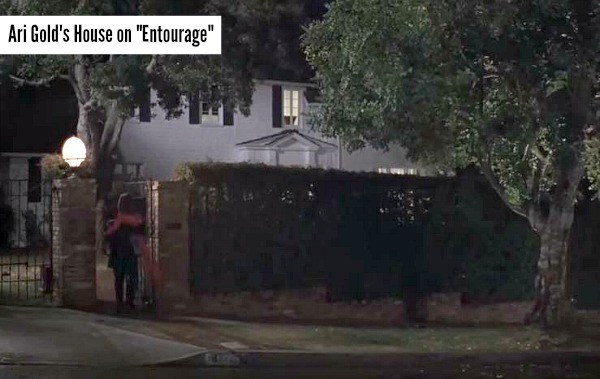 I’ve read articles calling it “the Ari Gold house” because it appeared on the HBO show “Entourage.” But as a fan of classic TV sitcoms, it will always be Ozzie and Harriet’s house to me! It underwent a major remodel recently, and although the exterior looks pretty much the same, the interior is almost unrecognizable. 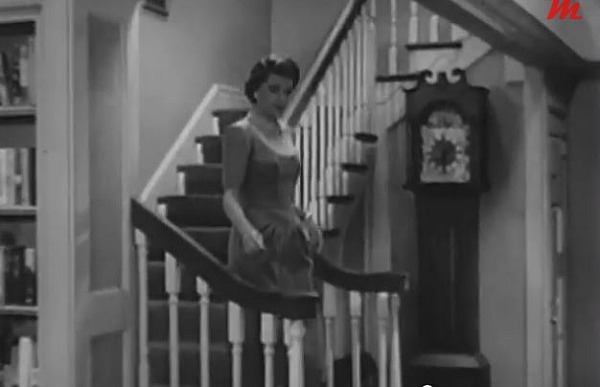 Keep scrolling and see what you think of Ozzie and Harriet’s house today. It was built in 1916 in the Hollywood Hills. They lived in the traditional center-hall Colonial for nearly 30 years. but they showed the real exterior each week on the show. Removing the shutters made a big difference in how the exterior looks. Do you like it better with them or without? A real estate investment and development company bought the house in 2013 for $3 million. After giving it a more contemporary remodel, they put it back on the market for $5 million. The listing described the newly remodeled home as an “East Coast Traditional” with 5 bedrooms and 5.5 bathrooms. I was so in love with their house as a kid. I wanted a traditional two-story just like theirs when I grew up. And now, after the remodel, the room is almost unrecognizable with all the woodwork painted white and part of the fireplace (including those little shuttered doors) removed, which made me kind of sad. Listing agent Eric Lowry of Coldwell Banker says Ozzie used to get himself a bowl of ice cream each night before bed. After he died in the house in 1975, the new homeowners would come down to find the drawer next to the sink open where the ice cream scoop was kept. His old model train in the pub room started mysteriously running in the middle of the night, owners related. Doors opened themselves, even though they’d been locked. The air would inexplicably, fleetingly smell of rosy perfume. Bedclothes would fly from slumbering bodies. The reports were so consistent that listing agent Billy Rose — who handled three sales of the house — felt compelled to tell prospective buyers of the rumored haunting. The kitchen has Viking appliances now. But in 1983, the owner at the time told a reporter that it still had the Hotpoint dishwasher and refrigerator that they advertised on their program, and they still worked fine. 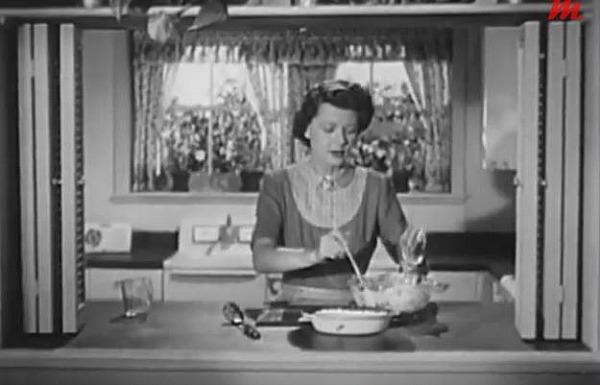 I looked up one of those old commercials that aired during the show and took some screenshots of them touting the benefits of the Hotpoint appliances that were used in Harriet’s kitchen on TV. Sherman is a designer, so I wonder what she’ll do with the house? Architectural Digest featured the Manhattan apartment that Sherman decorated. Their style seems to be fairly contemporary, although Chris says he’s a history buff who is really more of an exposed-brick, wood-beams, prewar buildings kind of guy. I imagine he’ll appreciate the history that comes with this house, too! For more information about 1822 Camino Palermo: Zillow blog, the listing, and Variety. Newer listing photos via Eric Lowry of Coldwell Banker. 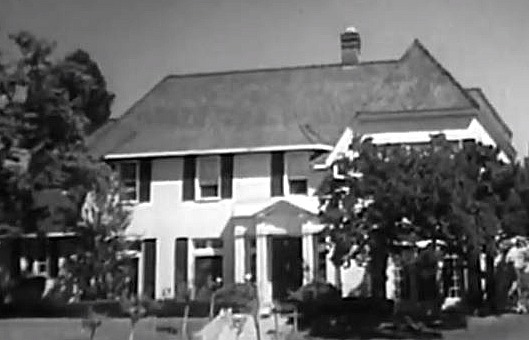 Thanks for stopping by and revisiting Ozzie and Harriet’s house today! Y’all come again real soon! If the house were mine, I’d probably want to make it look as much like it did in the “old days” on the show (while updating it a bit for livability, of course) just because I always loved it so much. So, yeah, I would’ve gone the more traditional route myself! I agree, Beth. The study was much cozier before. The front looked much better with shutters too. I even prefer the old kitchen over what they chose to change. Poor Ozzie, he probably does not recognize his house now. I too like the original look with the shutters outside and the wood inside and the fireplace with the little doors. Why do folks think everything needs to be painted white is a question I ask myself a lot? The TV show was a favorite and seeing this makes me want to get out my old 45 records by Ricky. Sigh! Nostalgia is a tricky thing..its hard letting go of the memories and things we grew up with but in practically if I were buying a house for that kind of price I would want certain things updated especially the kitchen and baths. I do love the new kitchen, master bedroom and baths but agree the study with all its beautiful warm wood should have been left alone. I also like the more cotemporary feel to the exterior without the shutters. 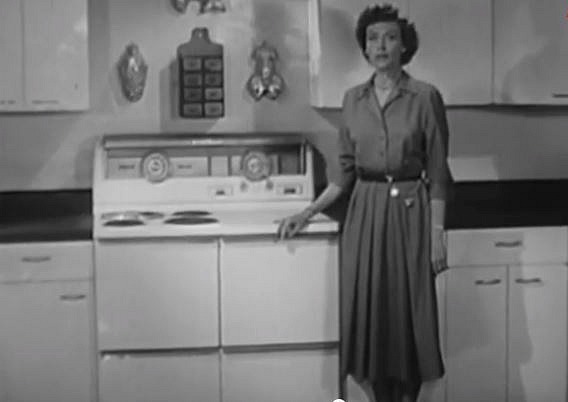 Isn’t it amazing that the homes original “Hotpoint” appliances were still in working order? Its a real testament to how well made things were made back then in comparison to todays appliances regardless of how high end they are. I love the hallway and the living room, but wish they had done less with the study and kitchen. I would have fiddled a bit, but not that much. The fireplace “cut down” is a shame. And you could get lost in that master bed and bath! Very interesting to see the house through the years – especially love these posts! I never watched Ozzie and Harriet. Don’t know why – I’m pretty sure it wasn’t before my time. If this was my house, I’d try to keep more of the traditional feel, while getting rid of some of that 80’s decor. Whenever people try to be modern and up to the minute with their decorating, it just looks dated in another 10-20 years. Stay as true as you can to the period of the house (if it was built the 50’s or before) and it will always look good. I like a good amount of white, but this is just too much. Too much white, not enough of the old personality. I hate what they did to the study. The paneling gave it a special feel. This is definitely not an improvement to me. LOVE this house! And to answer your earlier question, I prefer it with the shutters. I groaned when I saw that someone painted over the great woodwork! I’m never a fan of that! What a shame. It looks like a brand new house, and not in a good way. It’s truly lost its charm and character, and all evidence of its history is gone. I’m not suggesting anyone live in a museum of the 1950s, but preserving some of the style with at least a nod to the Nelson family would have been nice. I might have kept the Hotpoint! Agree! This is a house with a real Americana history. They should have kept some of it. And wouldn’t it be nice to see a gallery wall somewhere with old pictures of the Nelsons and the house and stills from the TV show. I saw Ricky Nelson perform at a fair somewhere when I was a kid.He dies a few years later. Sorry to be a party pooper, but I am so burnt out on the white and gray schemes in every single renovation. I get needing to update and the idea that white makes everything look ‘new and crisp’, but I would really like it if someone, anyone, would rebel and not go the safe, predictable route all the freakin’ time. How fun that you saw him perform, Fiamma! NBC recently replayed an old episode of “Saturday Night Live” from when Ricky Nelson hosted it a few years before he died. Did anyone else catch that episode? It took me back to my childhood seeing him sing again. It’s sad to think all four of the Nelsons are gone now. The floors are just awful. I will never understand taking a traditional house and making it something it is not. Nothing is more disappointing than seeing a beautiful classic exterior (though definitely better with the shutters) and opening the door to find something as incongruous as gray floors. Those will be the equivalent the gold builder basic fixtures of the 90s in ten years time, maybe less. I too love me some white, but what they did to that study is a crying shame, and frankly a co-op on the part of the designer. A truly talented designer could have made that beautiful wood look modern without having to paint it all. Agreed. They LA-ified it. Boring…and ruined the beautiful hardwood floors. It certainly could be updated without ruining the character of the home, which they did here. Oh what a trip down memory lane! 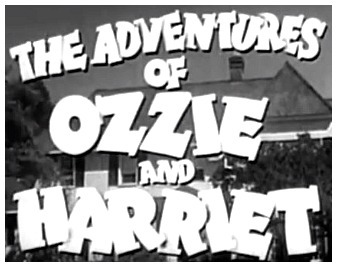 I loved watching Ozzie and Harriet as a kid. There’s even an old family photo somewhere that shows it on the TV. I couldn’t wait for the part of the program where Ricky sang and played at the end. I even had an autographed photo of Ricky in his Navy uniform. I must have been all of six at the time. I can also remember my older brother ‘torturing’ me by locking me out of the house when Ricky was on TV. We even had a Hotpoint range that looked very much like the one in the ad. I love the house, but am disappointed that they changed the woodwork and fireplace in the study/library. I agree with other commenters that I wish the trend for painting all woodwork and paneling (most often white or gray, but sometimes even black) would just go away. Same goes for beautiful wood furniture. Fine stained woodwork can be beautiful – the grain of wood has its own character – but people are afraid of ‘dark’ and brown. People who follow trends think it looks old-fashioned and out-of-date, and everything must be light and bright, or either, conversely, very dark as in charcoal or black or navy, but still painted. But once the woodwork is painted, it’s very hard to bring it back. Sigh. Another point about the study: the remodelers removed the shelves and added windows, so this room feels like the other rooms (though it looks like it may have a TV). What if you actually happen to have books or collections to display? As for the rest of the remodeled house, the foyer and living room are a definite improvement (though too gray/white for my tastes), the master bath is fabulous (and huge), and the kitchen, where they obviously took the wall with the pass-through down, is nice, but oh so trendy. And why does the refrigerator have to be so enormous? I think the earlier (80’s – 90’s) kitchen looks homier, though it definitely is not the 50’s – 60’s version. As for the shutters, I’m a purist. I like them on the single, double-hung windows, but not on the wider multiple casement windows or French doors (unless wide enough to match the opening). Thanks for the nostalgia! I guess that is kind of confusing. One photo is a before photo taken several years ago before the remodel and one is how the entry hall was recreated for the show (it was a set on a soundstage). It makes sense that the black and white was a sound stage. But the different layout and number of stairs in the others threw me…. I guess the remodel changed both. Thanks. Yeah – it looks like they completely ripped out the stairs and redid them. Now they go all the way to the opening to the other room, and there are 17 of them… before they stopped a good 3-4 feet short of the opening and were only 14…. good eyes! I barely remember it – I was born in 1958, so it was a bit before my time. It’s rather disheartening to see how much it was remodeled, especially the kitchen. I loved the kitchen in the before pictures. That is why I love old houses, their charm is something undeniable to me – and when it is remodeled beyond recognition, it’s just very sad. I am in shock over how many bad design decisions were made with this house! Why anyone in their right mind would opt for the new flooring over the hardwoods with this style of house is beyond comprehension. I even like the black and white in the foyer more than the new—not saying I would keep it, but they sure look better than the choice made here. It looks like they also shrunk the opening (with pocket doors!) to the room on the left—why??? Again, it destroys the house’s integrity. While I’m not a fan of paneled walls in general, I thought the originals in the study were quite nice. The worst though, is the painted ceiling. It makes the room look like a spaceship! I could go on and on…Sorry for being so negative, but I hate seeing this kind of thing done to house like this. For me, this belongs in a “What NOT to do in design and remodeling” tutorial. Glad to see I’m not in the minority. I thought most of the choices they made were in the wrong direction. They took an older house with character and made it as generic as they could. Did they even take out a pop-out window in the kitchen, in favor of a flat wall of granite? I wouldn’t want their karma, after what they did to the study. But what I really responded to was the outside spaces. Man, I’d love to get my hands on those grounds. They could be beautiful!!! 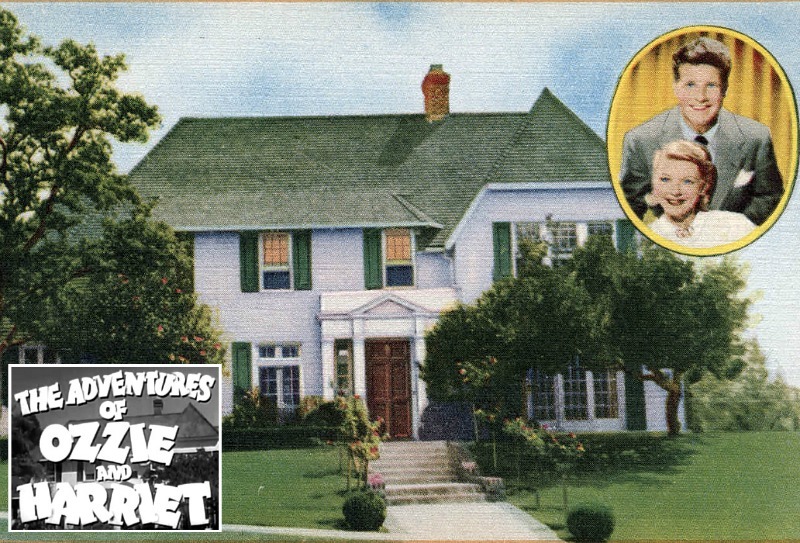 I never watched Ozzie and Harriet, but I do recall this home from Entourage. I remember thinking that a smarmy man like Ari didn’t suit a lovely old home like this. 🙂 I agree with much of what other readers have said. They have spoiled many aspects of this character house with too many “upgrades”. It would be like seeing the Brady Bunch house made into a neutral shell of its former self. Interesting how much our pop culture influences stick with us throughout life! Another great post, Julia. I do not like the study with the honeycomb ceiling or whatever that is. So ugly. I really do not care for modern traditional. I find marble to be very cold and sterile. I am sure alot of people would kill to have alot of marble, but there is nothing homey about it for me. I like parts of the house, the backyard is my favorite. Sigh… I’ll just bet you know exactly what I think of this remodel. 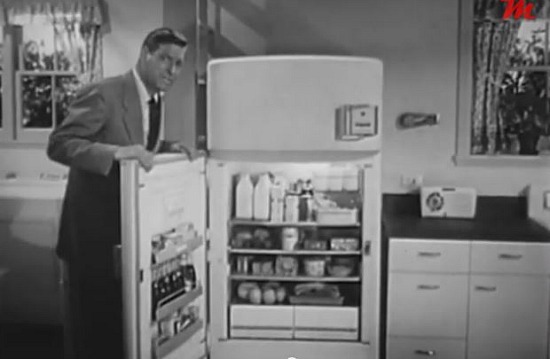 I’ve been watching past episodes off and on to see if I can find a hotpoint fridge like mine on there, but no luck yet. This brings back alot of memories for sure. Oh yea crush on Ricky, I like the house now also, with its new transformation. Thanks Julia , this was sure a trip down memory lane! Hmmm, I wonder if Chris Meloni and his wife are reading these comments. I do like the renovations minus the den — oh that lovely wood paneling! To shame for removing it. And I also agree the hardwoods probably didn’t need replacing, although I would have perhaps stained them — the orange-y tint isn’t my style but they did look like they were in good condition. I do like the “new” foyer though – loads better than the old checkerboard one! When I first looked at the pics I thought THAT was the new one and I gasped… Whew! Hi Julia I did have a crush on Ricky and I liked his music. What a beautiful home I love the kitchen and the bathroom….gorgeous. The yard is also beautifully done. Now that you have taken me down memory lane, you know what I’ll be looking at tonight…YouTube. Thank you for sharing beauty. Till next time, Regards Esther from Sydney. PS hope your very cold looking weather is improving…..quite amazing all that snow I know I wouldn’t survive without a heater attached to me. 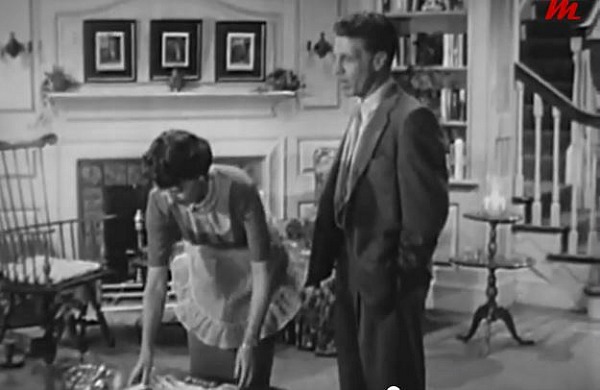 Ozzie and Harriet were way before my time. In fact, my only real lasting memory of the show is the episode of Gilmore Girls when Rory tried to do the Harriet thing for Dean. Also, I lurve Chris Meloni. That said, the remodel has killed that house. It isn’t unattractive or gaudy. It’s soulless. If that is what you want in your house, why not build new? LOVED this post! The house is exquisite! I pine for those “simpler” days. The one room I really wished they would have kept intact was the paneled study. They ripped it all out! Lighten it or paint it, but don’t rip it out! I should have explained myself better. I love the original architecture of the home and although I think some of the modifications worked, I would have loved it more if the home hadn’t been so modernized. 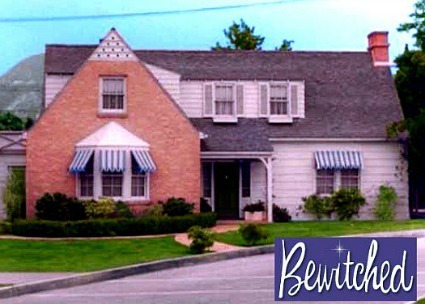 Hi Julia, I didn’t realize that the home in the show was actually there’s. I so loved The Nelsons and I feel sad that the home wasn’t kept as a sort of museum..but I guess that wouldn’t be financially viable. I would have kept the shutters for sentimental reasons, but I do think it looks rather nice without them. I used to make my dad (or mom) always turn down Camino Palmero in the early 50s when we were close by so I could see if then still pre-teen Ricky or teen David Nelson might just happen to be out in front. It was a dead-end street so I got a double dose of careful looking! I had a crush on Ricky even when he was a dorky little kid in the first years, through his braces and his voice all cracking in puberty. I grew up fast too then and soon was going to see him at events like the live AM radio remotes at a local drive-in he did a few times once he ‘hit’ big time in music. Love it! If I’d grown up around there, I’m sure I would’ve been begging to do a few drive-bys past the house, too. Ha. The family home in Laguna was really swell too — you could see if up on the cliff from the beach down below and sometimes in the mid 50s when I was there, my cousin and I were swimming in the surf with Ricky. We didn’t go down there much because my folks had membership at the Balboa Bay Club and that kept us tied to that area a little further north most of the time. Not sure if there are a lot of good photos of their home in Laguna but it was really nice. I think there were some ‘fan’ family photos of it done long ago in the 50s as I recall. Ugh! Not feeling any warmth or charm here. Looks like the original windows were replaced. Too bad, the six over six (?) originals with the shutters were lovely and in keeping with the architectural style of the house. I like the way it was decorated for the television show. It is too formal, contemporary and cold looking now. Does not feel comfortable and homey, but maybe if I had 5 million dollars I would want something like that…. I like smaller and more lived in look. Libbie, yes, I had forgotten the Dutch door. What a pleasant feature that is. All in all it was a warm, wonderful home. We didn’t have Dutch doors where I grew up, but everyone had a screen door and often, a screened in porch. Doors weren’t locked then, either. It was a different time. Blech! Not a shred of its former charm & history left…I hope Ozzie goes and haunts those investors. On closer inspection, I can’t make out the paneling in the study at all. Methinks it wasn’t painted white, but removed and then the walls were painted white. F-!